Welcome To Day 2 Of Baking With Pumpkin! Today is a beautiful day..another perfect day for baking! It has been incredibly windy here today, blue crisp skies, which invited me to open all my windows in my home. My dogs are not too pleased with me though, ever since moving here & having earthquakes…they don’t like loud noises and with the wind whooshing through the house it has created a little noise and movement. Clearly I don’t mind it,lol. Anyone else baking with Pumpkin this month? I have a perfect cookie for you today. They smell amazing, your house will smell amazing and your mouth will be happy. 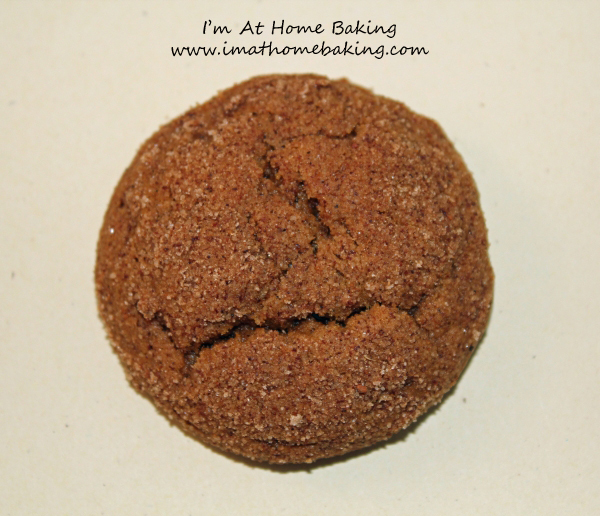 These “gingersnap” cookies are not your traditional “crisp” cookie. It is more like a soft cookie. I like them either way. These are easy to make with a short chilling time. You may want to make a double batch as these are very tasty. The scent alone will entice people to want to try one & eat many. In a large bowl, whisk together flour, baking soda, cinnamon, ginger, cloves and salt; set aside. In the bowl of a stand mixer fitted with a paddle attachment, cream the butter and 1 cups sugar at medium speed until light and fluffy, about 2 minutes. Scrape down the sides of the bowl with a rubber spatula as needed. Add the egg and beat at medium speed until combined, about 30 seconds. Add the pumpkin puree, molasses and vanilla and beat at medium speed until combined, about 30 seconds. Add the dry ingredients and beat at low speed until just combined, about 30 seconds, scraping down the bowl as needed. Refrigerate the cookie dough for at least 1 hour. The dough can be chilled for 2-3 days. Adjust the oven racks to the upper-and lower-middle positions and heat the oven to 350 degrees F. Line two baking sheets with parchment paper; set aside. Place the remaining ¼ cup sugar and pumpkin pie spice for rolling in a shallow bowl. Fill a medium bowl halfway with cold tap water. Dip your hands in the water and shake off any excess (this will ensure that the sugar mixture sticks to the dough). Roll a heaping tablespoon of dough into a 1½-inch ball between moistened palms, roll the ball in the sugar mixture, and place it on the prepared baking sheet. Repeat with the remaining dough, moistening your hands as necessary and spacing the balls about 2 inches apart. Bake the cookies, one sheet at a time, until the edges are set and cookies look cracked, 10 to 12 minutes, rotating the baking sheet halfway through baking. Cool the cookies on the baking sheets about 3 minutes; using a wide metal spatula, transfer the cookies to a wire rack and cool to room temperature.